Why is the Rum Gone? Bring the Bonus and The Spins Instead! 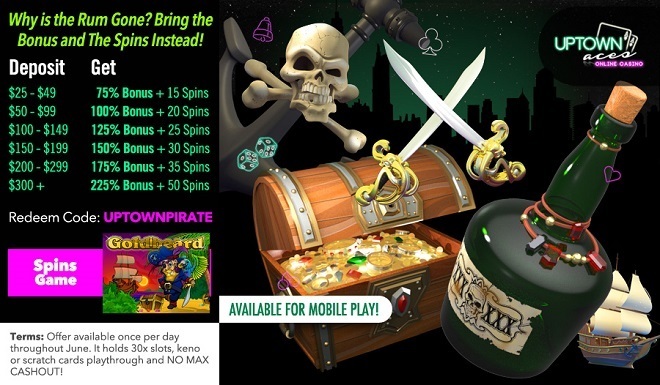 It has been said that drinking rum before 10am makes you a full on pirate – but what about playing a pirate-inspired slot once per day throughout the month of June? Well, that just makes you a winner! Deposit as little as $25 and sail towards wins on the reels of Goldbeard where you’ll be playing the Double Prize Wild Goldbeards, Pieces of Eight Total-Bet Multipliers, Free Spins and Prize Multipliers and a Random Progressive Jackpot. Open a treasure chest packed with golden coins and huge wins this June when you spin the reels of Goldbeard with up to a 225% Match + 50 Free Spins! Offer available once per day throughout June. It holds 30x slots, keno or scratch cards playthrough and NO MAX CASHOUT!